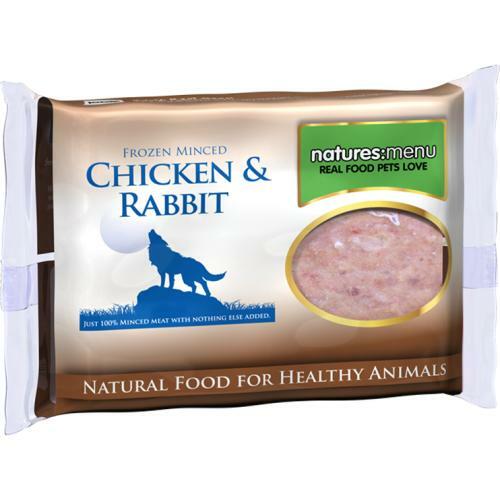 Natures Menu Minced Rabbit & Chicken in convenient portions contains nothing but ethically sourced, human grade minced rabbit and chicken with finely minced raw bone for added nutrition, ideal for making a home prepared nutritious and natural meal for your dog. To ensure your four legged friend gets a complete and balanced dinner, it is recommended that each meal be prepared with 60% Natures Menu meat or mince, 20% blended fruit or vegetables, and 20% easily digestible carbohydrate such as cooked brown rice, oats, or sweet potato. Fresh water should always be available. Thinking of switching to Raw but not sure how? Read Natures Menu Transitioning guide here.